For a number of years Danny Garcia (34-1, 20 KOs) and Shawn Porter (28-2-1, 17 KOs) have been reliable performers under the Al Haymon boxing umbrella. Although neither has ascended to superstar status in the sport, both have notched some impressive victories, but they also have come up short against top-caliber fighters in the welterweight division. Each has been a former titlist at 147 (Garcia also was a champion at 140) and they've performed similarly against common opponents – knocking out Paulie Malignaggi and losing a competitive fight to Keith Thurman. 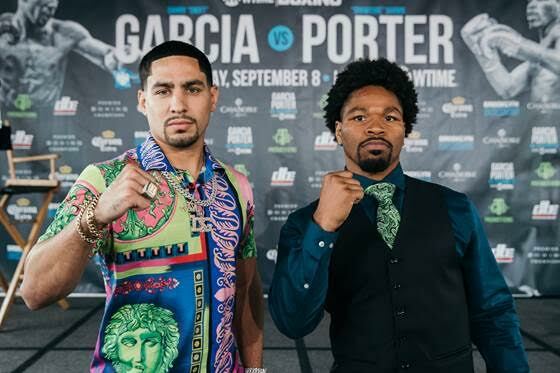 On September 8th at the Barclays Center in Brooklyn (televised by Showtime), Garcia and Porter will face each other in what should be a fascinating matchup. The winner will most likely be in line for a huge fight against titleholder Errol Spence Jr. while the loser will continue to circulate as a B+ attraction in the sport. Garcia and Porter (both 30 years old) have known each other since the amateur days (where they fought in different divisions). And although they share similar records, KO percentages and career trajectories in the professional ranks, how each achieves success in the ring is starkly different. Garcia's ring identity is that of a poised, pocket counterpuncher. He draws out a mistake from his opponent and then pounces. Featuring a cracking left hook and a variety of right hands, his success can be attributed more to timing and punch accuracy than sheer power. Porter has developed into one of the premier pressure fighters in the sport. Bull rushing opponents with loads of power punches and fierce inside combat, Porter wears out foes through brute force and will. It's not that he's without technical skills, but they are only a part of his repertoire. What makes the Garcia-Porter matchup so interesting to me is that each fighter possesses the exact strength that could nullify the other. Garcia can be outworked and perhaps there are questions about his fire. Although he has only lost one fight officially, he has been on the fortunate end of a few decisions. In a handful of the competitive fights that he won, for example against Lamont Peterson, Zab Judah and Mauricio Herrera, there were large stretches of those bouts where he was clearly second best. Porter has never had any concerns about his work rate or his competitive spirit. But in his only losses (against Thurman and Kell Brook) he was outclassed by cleaner punchers. Brook controlled the pocket with his jab and pinpoint counters. Thurman used his boxing skills and feet to reduce Porter's effectiveness. Garcia is not a fighter who will be intimidated by Porter's aggression. He's faced bigger punchers (Lucas Matthysse) and better athletes (Amir Khan). In addition, if it comes down to cleaner work, his punches are easy for judges to see. Porter can smother himself in close quarters and many of his punches are only partial connects. It can be very challenging to ascertain what he lands 100% cleanly. In talking with a handful of industry types and several boxing fans about the matchup, I've been amazed at the variety of predictions. Essentially every possible result (Porter KO, Porter decision, Garcia KO, Garcia decision, and draw) has been suggested to me, and there is a legitimate case to be made for all of them. It's rare when a major fight has so many feasible outcomes on the table. Here are a few things I know about the match: Danny Garcia has a rock-solid chin. I've seen him hurt before, specifically against Judah and Thurman, but I've never seen him go down. Because he's so poised in the ring and so keenly aware of his surroundings, Garcia is masterful at disguising to his opponents when he's hurt. And even if Garcia is clearly affected by a big punch, he is very dangerous in this circumstance. He has a wipeout counter left hook that demolishes overconfident fighters (hello, Amir!). In addition, he knows all of the veteran tricks to buy time, from holding to tying up to using the ring to fouling. Could Garcia be knocked out? Sure, but it will take one special performance to achieve that. As for Porter, I'm not sure if I've ever seen him hurt. He was certainly dropped by a counter left hook by Adrien Broner, but that was a flash knockdown and he persevered through that moment with aplomb. Many fighters have landed cleanly on Porter with their best artillery and he has seemed to take the incoming fire just fine. However, there are a few things about the fight that I'm unsure of. Both Porter and Garcia have problems stringing together dominant 12-round performances against top fighters. Garcia can often be a "tale of two halves" type of boxer. He had great first halves against Peterson and Judah, but struggled in the latter portions. After trailing Matthysse early in their fight, he came on strong in the back half. It's never clear where and when Garcia may switch off, but rest assured he will. Porter's issue is slightly different. Because he fights in such a high-energy style, there will be a couple periods during the fight in which he can't sustain his effort, or he'll just take a round off. Those breaks happened against Devon Alexander, Broner and in his last fight against Adrian Granados. Perhaps most distressingly, Porter was cruising against Granados and then stopped his offense by the end of the 10th round. Yes, he was up significantly on the cards, but still he let Granados tee off on him to end the fight. Those last few rounds were so concerning to some boxing observers that more than a few suggested that Porter was either injured, or perhaps that age had finally caught up to him (his kamikaze style doesn't lend itself to long peaks in the ring). All of this leads to doubt, but in a satisfying way. I'm excited to go to Brooklyn for the fight, and I really don't know what will happen, or what tea leaves to read. There is no conventional wisdom for this matchup. Positive and negative signs exist for each fighter. Does Danny really punch hard enough at welterweight to keep Porter off of him? Is Porter starting to slip away from his athletic prime? It's also worth considering one other important factor in the fight: the judges. 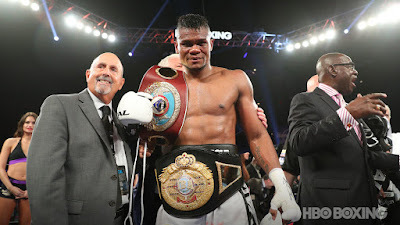 Porter's style, which has been refined in the Las Vegas gyms, appeals to judges who like the aggressor in each round, an attribute that is often more pronounced in the western part of the United States (such as with a judge like Dave Moretti). Danny Garcia plays to those who favor clean punching, something that in my opinion is more popular with New York/New Jersey judges (think Steve Weisfeld). When asked for my opinion on the matchup, I've told people that I think this will be a judges' fight – by which I mean that I believe it will be close and it will come down to the individual stylistic preferences of the particular judges. It very well may be a 6-6 or 7-5 fight that could go either way, with the "either way" dependent on what scoring attributes a boxing judge favors; there may not be a right or wrong answer. Or perhaps it won't unfold that way at all. Errol Spence looms, and the winner of Garcia-Porter stands to make excellent coin for that fight. For Garcia and Porter, $2.5M or so could be their final nest egg, that last remaining piece of financial security. In addition, both fighters have relished being underdogs in their careers. Although neither has lined up to face Spence to this point, rest assured, for the right amount of money and attention in the sport, I think that both Garcia and Porter would relish the opportunity to fight the bogeyman at 147. But first things first. They have a hell of a fight on their hands. Every small decision from sleep to training schedules to judge selection to corner advice could make up the small margin that shades the fight from 6-6 to 7-5. One moment of fatigue or brilliance could be enough to swing a round, and potentially the fight. The margins may really be that thin. The fight is out there for whoever's hungrier, sharper, and perhaps a bit more fortunate. We had a fantastic podcast this week. Top prospect Teofimo Lopez joined us to talk about what's next for his career. He gave us an absolutely wonderful interview. We also spoke with promoter Tom Loeffler about Canelo-Golovkin 2, Superfly 3 and Usyk's triumph in the World Boxing Super Series. In addition, Brandon and I talked about the memorable Kovalev-Alvarez fight, and I gave my impressions on the scene from that wild night in Atlantic City. Let start with the first knockdown in the seventh round. Eleider Alvarez throws a jab to Kovalev's upper chest. Then Alvarez comes back with an overhand right over Kovalev's ineffectual counter left hook. Kovalev feels the sting of the punch, freezes and then stumbles back a couple of steps; his legs start to betray him. 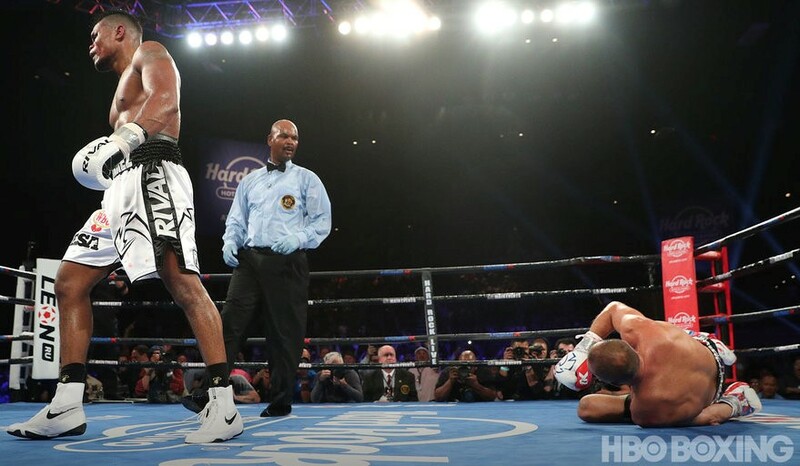 As the full impact of the blow manifests, Kovalev's legs completely give way and he falls to the canvas. After the fight, Alvarez and his trainer Marc Ramsay referred to that combination as the "Macintosh". They had practiced it specifically for Kovalev. Alvarez revealed that Ramsay asked for that combination heading into the seventh round. Message received, and in a few short moments, a new light heavyweight champion was born. Why that combination can work on Kovalev is that sometimes he has a slow reaction time on defense, especially when he has to change his eye level from body to head. Ramsay said after the fight that there were a number of things they noticed in Kovalev's past fights that they thought could be exploited. Count the "Macintosh" as one of their prime successes during training camp. Kovalev got up from that first knockdown, perhaps too fast, and still had a good 20-30 seconds until a punishing sweeping left hook/straight right hand combo knocked him down again. It was in those 20 to 30 seconds where I believe that Kovalev made his only grave mistake in the fight. Instead of holding on, clinching or moving away from danger to buy time, Kovalev immediately started to fire back. On one hand, he was responding like a real fighter, but on the other, he wasn't acting like a smart one. The decisions he made immediately after the first knockdown are what sealed his fate on Saturday. Sergey has always exhibited a sign of disbelief after he gets hurt. It's almost as if he says how dare my opponent have the tenacity to try to fight me! It speaks to his essential ring identity; he is the bully, the one in control. This occurred in the second Andre Ward fight and also in his first matchup against Jean Pascal. Ultimately, he doesn't respect his opponents. He believes that he is unbreakable and when he does get hurt, he lacks the humility to try Plan B. He immediately wants to settle the score and this leads to him taking even more punishment. Alvarez, who was down on all three scorecards entering the seventh round, dropped Kovalev with different punches in each of the three knockdowns: Overhand right, left hook/straight right combo, and a right hook. In addition, his jab was crisp throughout much of the fight. He displayed versatility, creativity and a good chin; it was a damn good performance. He was also losing. To my eyes, Kovalev fought exceptionally well in the first six rounds of the match. No longer the plodder of recent outings, he was on the balls of his feet almost all night, expertly cutting off the ring and making impressive athletic moves. When Alvarez tried to escape, Kovalev moved with him. He also did an excellent job of getting in and out of the pocket, using his feet to reset the action. Kovalev displayed a number of new wrinkles during the first six rounds of the fight. 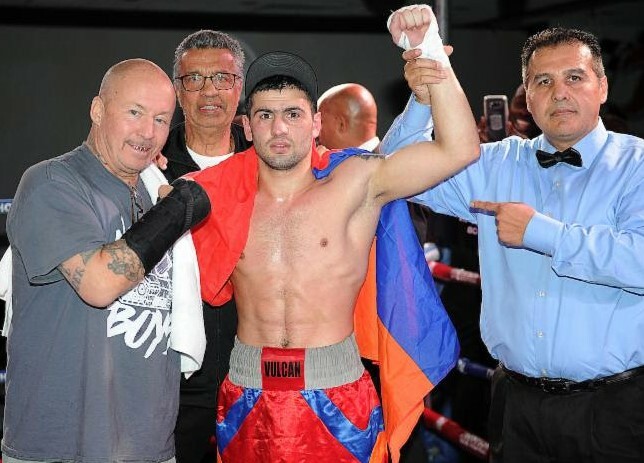 His work with trainer Abror Tursunpulatov was bearing fruit. In the past he was essentially a two-and-a-half punch fighter. He would dominate opponents with his jab, right hand and an occasional left hook. However, on Saturday Kovalev was throwing double lead left hooks to the body and head, lead uppercuts and counter uppercuts, the types of punches and punch sequences that he had never before utilized on the world-level. This expanded arsenal helped him establish primacy in the fight. In the fourth and sixth rounds in particular, he was doing major damage with an array of power punches; Alvarez wasn't prepared for Kovalev's variety. At the post-fight press conference, Alvarez said that Ramsay implored him to go on the inside in the seventh, to take the fight to Kovalev. According to both it was all part of the game plan. Ramsay said, "We knew coming into the fight that we might lose a few early rounds. It was our plan to use our physicality in the second half of the fight." That "Macintosh" combination in the seventh short-circuited the plans of wearing down Kovalev. But Ramsay helped instill a mindset in his fighter: It was now time to be aggressive, to look for big shots. And Alvarez heeded his corner's advice and executed the best sequences of his career. It was a perfect example of a trainer and fighter working in unison. Also, I want to dispel two myths from the fight: 1. Kovalev gassed. 2. Saturday's fight was somehow a continuation of Kovalev's two bouts against Ward. In Kovalev's last three completed rounds of the fight he threw, according to CompuBox, 82, 37 and 55 punches. The 82 punches in the fourth was his high watermark for the fight. The 55 punches in the sixth were his third highest. In each of those three rounds, he threw over 20% more punches than Alvarez did. Even in the seventh round, where Kovalev spent a major portion of it hurt, he still threw 44 punches to Alvarez's 49. So in essence, if Kovalev somehow tired, wilted or gassed in the fight, the evidence doesn't show it based on activity. Even after being dropped, he came back firing punches. There was nothing about his performance that points to being gassed. Second, there's no doubt that Kovalev had wilted both physically and psychologically during the second Ward bout. He was a beaten fighter at the conclusion of that match. With that stipulation aside, I didn't see any similarities between that performance and what I observed in Atlantic City on Saturday night. Kovalev got up from two huge knockdowns. To his credit or discredit, he tried to fight back as hard as he could. That is not what a beaten fighter does. A defeated fighter stays on the canvas, or refuses to let his hands go, or stares at his corner or the ref once action resumes, or turns his back to his opponent. On Saturday, Kovalev did none of those things. Everyone likes to get sucked into grand narratives, but sometimes events are discrete. Yes, Kovalev lost to both Ward and Alvarez. However, he didn't quit against Alvarez and showed no external signs of yielding. These distinctions matter because many boxing observers are using Saturday's results to weave grand tales of Kovalev's failure as a fighter and a competitor, at the expense of Alvarez's tremendous performance. I'm not saying that fighters shouldn't be criticized. Of course they can and should be when warranted, but be accurate. Kovalev didn't lose the fight; Alvarez won it. Ultimately, Kovalev was beaten by a boxing move. A fighter practiced a specific combination in the gym and executed it perfectly in the ring. Similar to when Jermall Charlo dropped Julian Williams with a counter right uppercut, sometimes a fighter makes a superior boxing move, and it turns the fight. It doesn't make Kovalev or Williams physically or mentally inferior. All it means is that on a particular night, an opponent beat them due to ring craft, practice and execution. Alvarez earned his victory on Saturday; nothing was gifted to him. Having enjoyed many memorable boxing nights in Atlantic City over the past 15 years, I was elated to see a packed house on Saturday. It certainly brought back memories. Over four years since the last big fight in Atlantic City (Hopkins-Kovalev), it was great to see the casino buzzing and the bright lights of HBO Boxing returning to the shore. Atlantic City has faced hard times over the last decade with a number of casinos shuttering and tens of thousands of jobs lost. Even some of the casinos that survived, such as Caesars and Bally's, have been saddled by their corporate parents with so much debt that they've just been hanging on. Emerging from all of this wreckage, two new casinos opened this year, the Hard Rock Hotel and Casino, which hosted Saturday's fight, and the Ocean Resort Casino, which will hold a Top Rank card in two weeks. Both properties are refurbishments of casinos that had closed. Atlantic City had been a top boxing destination since gambling was legalized in the jurisdiction in 1978. Now, with new players in the market, there exists a significant opportunity to reestablish a boxing presence. In the summer there may not be a better place in the country to experience a boxing weekend. In addition, with the Hard Rock venue and Boardwalk Hall, there are now at least two excellent fight venues in the resort town. Main Events and the Duva family have promoted shows in Atlantic City for decades. They understand how to do their job. Yes, Alvarez brought a number of fans from Montreal and Kovalev has built a consistent following among boxing aficionados and Russian-speaking fans from the Northeast. But there were also other touches. Karl Dargan fought on the undercard and brought down a couple hundred fans from Philadelphia. Frank Galarza had a sizable Brooklyn contingent for his fight. These are the little things that seasoned promoters do to help sell tickets and create a better atmosphere in the arena. And the arena was certainly rocking after Alvarez's knockout win. I hadn't witnessed such jubilation in a crowd since Marcos Maidana beat Adrien Broner in San Antonio in 2013. For a first event in a new property, Saturday's outcome was ideal. Every one of the 5,600 fans in attendance will remember Kovalev-Alvarez. Perhaps a new star was born with Alvarez, and many new boxing fans may have been hatched as well. I'd say that's a great night for the sport.